Add the wonder of the woods to your medieval or fantasy outfit when you wear the Woodland Embossed Ring Belt. 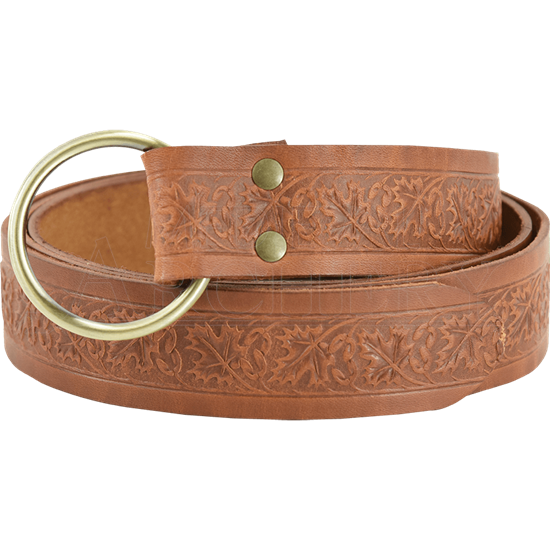 This essential leather belt has an elegant leaf pattern throughout, and it comes in a multitude of colors to match any look. Secured by threading the belt through the O-ring and tying a knot, this medieval staple is a must-have for LARP and Renaissance fair costumes. The hardware comes in your choice of steel, brass, or antique brass in tone. Accent your next look with just the right amount of natural charm when you wear this beautifully embossed leather ring belt. Available either 60 or 72 inches long. When selecting your size, please keep in mind that the knot generally takes up about 12-15 inches of length.